Jihan you have a diverse background and multiple identities, you are also polyglot—conversing with ease in Arabic, French and English, how do you negotiate these identities? How do you bring them together? I’m not sure I have multiple identities, I have multiple spaces in which I navigate. My dad was a diplomat and we moved around my whole childhood. So we did not have much time to adapt, wherever they plunk you, you need to get on with it. I guess it became a habit. I was born in Lebanon, then we went to Panama, Finland, England, and all over the chart. The first language that I must have read was Finnish. So when we moved to London my family realized that I only spoke Finnish, they had to get my nanny back until I made the transition into English (laughter). I only went back to Egypt when I was around thirteen. And that was a bit of a shock because one spends one’s life saying, I’m Egyptian, and when you go back to Egypt you feel totally out of place, you barely speak the language and all the details you don’t know about, so it took some adjusting because that was home and that was the first time that I had been to the home that had been attached to us, basically. I had a big problem with Arabic as a language because we did not speak it. We had to learn it the hard way. My father got us this sheikh who literally taught us Arabic with a stick (laughter). When I went to university, of course I spoken Arabic by then but it was difficult and I decided never to touch Arabic again. But obviously later I realized that it was an asset that I had to use and my first job with Reuters at the beginning was on the Arabic desk. I remember I used to take my grammar book to the bathroom and looked at the verbs and the conjugation before I’d write my stories so that I would not get told off (laughter). Those were the early years, and ironically I started traveling myself, I wanted to be an academic and after I finished university I had a wish to go to Oxford but my father would not let me because as a single woman he did not want me to travel and live alone. I think he regrets that decision because that is when I broke free. I decided to start working to save up money to go to Oxford and I ended up becoming a journalist. That is how I got my job at Reuters because I wanted to save money to go to Oxford. But I started journalism at one of the most exciting times in Egypt and I was slam bang in the middle of all the events. I went on being a journalist mainly covering the PLO and Islamic movements, which were my two beats. And then came the Gulf War. As a filmmaker you have had many experiences that provided you with a very particular perspective—academically you studied political science and you worked for sometime as a journalist for many prominent news agencies. How do you connect your academic studies and journalism to filmmaking? I think that could be attached to the whole problem that I had with the Gulf War. I realized that as journalist we do not have the time to look into what is actually happening. We have deadlines everyday so you just skim the surface constantly and you don’t get to the bottom of what this is all about. And that is why I chose documentary. Because documentary was about taking the time to look into a topic that is close to your heart and really looking at it in an angle that you choose. And doing the research and taking the time and formulating it in a way that is your own expression. Where as a journalist, there are so many constraints in terms of space, the number of words, when your editor wants it, who’s going to edit it back there. So this was not what I was looking for. What I was looking for was a mode of expression and that I obviously didn’t find in journalism. I can actually tell you the moment where all of my worlds came together. I was watching the documentary The Death of a Nation about the war in Yugoslavia, it must have been in 1995, 1996. I had already started doing a bit of film here and there. And if you see my old work it’s quite different than what came after that. And I watched this six-hour documentary, it was so well researched that it is almost a doctoral thesis, combined with archival work that no one had ever seen, combined with beautiful storytelling. And it was such a complicated topic, and I remember at the time that no one could really tell what was happening in the former Yugoslavia. There were wars in Bosnia, there were wars here and there; the whole place was breaking up. No one could really understand, myself included. And in this one stretch of six hours, I understood what it was all about. And the story was told beautifully and it was this combination of the visual, the academic and good storytelling. And I told myself: that is what I want to do. So I looked up the production company, which was called Brian Lapping at the time and it is currently called Brook Lapping. It was quite ironic because at the time I was preparing a film for France 3 about fifty years of the Arab-Israeli conflict, and when I called them they were doing a six-hour film about the Arab-Israeli conflict. While I really wanted to work for them, I was doing what was considered the rival project. And I decided to quit my project and work with them as an associate producer. I downgraded myself because that was what I wanted to learn. I worked there for two-three years and by the end of the project I ended up co-writing the book that was the basis for that series. And I never looked back from there. It was funny because later when they were doing the sequel for it they called me back and said, “do you want to do the film with us?” I said: “no, I did that film because I really wanted to learn what you were doing and how you were doing it.” Not all of what they were doing suited my purposes, so I basically took out of it the technique that I needed to tell my own story and find the formulation of my own expression. The series producer is a lady called Norma Percy. I consider her my mentor, she was uncompromising, in the smallest detail: you check it once, you check it three times. She was very, very strict, seeking perfection. I was really happy to realize that you could do that in film too. But I never went back to do any other film with them. 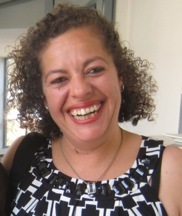 When the South African film was shown in London she came to the screening. And she said to me, “now I understand how in a way you are doing the Brian Lapping method, but in a way you are not at all.” I basically found my own language during that apprentissage. Your work reflects a very eclectic interest. Could you talk about how you choose your subject matter and give some reflections on your experiences making and producing your films? My first proper job in film if you want, was with the French production company Capa. At the time I did not have the option to choose exactly what I wanted to do. There were certain topics that I would propose and that they would allow me to do but it had to fit within what the production company was doing. I did a whole series of a project called “24 Hours”. And basically it was churning out a 52 documentary every week. We’d go cover one event with six cameras, come back the following day, edit the whole thing and it was out on TV the following week. In terms of training that was amazing because in a way you could put together a 52 documentary in a week, no matter what the topic is. Once you’ve gone beyond that stage the problem is not how to make a film, the problem is why do you want to make a film and what you want to say with the film. Half of them are not even on my CV, we made so many of these. And obviously after a while that isn’t what I wanted to do. I didn’t want to churn out films. Capa called me back after I finished the Arab-Israeli conflict project in London. And I said that I would only come back if they allowed me to do the topic that I wanted to do. And that is how I did, l'Afrique en morceaux: la tragédie des grands lacs, which is about the Congo. And I had a very bad experience there but it was part of the learning process. In the documentary world it is very tough. Being interested mainly in Africa—and based in Europe—very few companies will take on an African topic. You fight for it and by the time the production accepts your fight, you have raised half of the money but you need a production company with which to do it. They act as though they are doing you a favor. I had a couple of other bad incidents and then decided to set up my own company. Which is not what I wanted to do. I never wanted to be a producer. I honestly believe that producers and directors have their separate jobs and they are complimentary. But being from where I am, and doing the kind of films that I am doing, it is very difficult to hand over the production side. So now I have my own production company and I only do films fifty-fifty with any production company. And to get back to how I choose the topics, for me the topic not only has to resonate, the question has to be something that I need to understand. And something that obsesses me to the point that…it takes me three, four, five years to make a film, it can’t be something that isn’t close to my heart, it has to be something that I need to find out about. Because otherwise, how do you sustain four years? The main question that I have been revolving around has been African liberation movements in a way, but I guess it is more about how in the 50’s and the 60’s all of these people had the vision of wanting to break the shackles of colonialism despite how impossible it must have seemed. There was this big mammoth called colonialism but they stood up and fought against it and won their independence. And my question is what happened after that? How can we look at our countries now and see the independence that we fought for and had such a vision for, bring such mitigated results for the average people. It is the whole question of trying to understand the process and the realities of that period and how we got there. Is it a problem of power? I don’t believe in this whole “corruption is African”, I think corruption is something that is international, but somehow we’ve been labeled as corrupt governments and I need to understand that. And to understand the origins of these conflicts that have cursed our continent. Where do they come from and how are they sustained? Your approach to the subject is very probing and perhaps for some, controversial. Are you free to come and go in relative safety? Do you have enemies? How are you able to work on such delicate issues and continue to navigate around freely? I don’t think I am naïve, and I don’t think these are things that I should worry about. I don’t think of it ahead of time. You can say I’m inconsciente in the French sense. I’ll walk through minefields ignoring the fact that they are minefields and it could blow up in my face. I guess that I’ve been lucky at the moment that it has not blown up in my face. I have had dodgy things happen and I have had problems, but I think that when we do a profession that is by nature quite difficult and the kinds of topics are by nature quite difficult, that’s part of the deal. I don’t think of it twice. 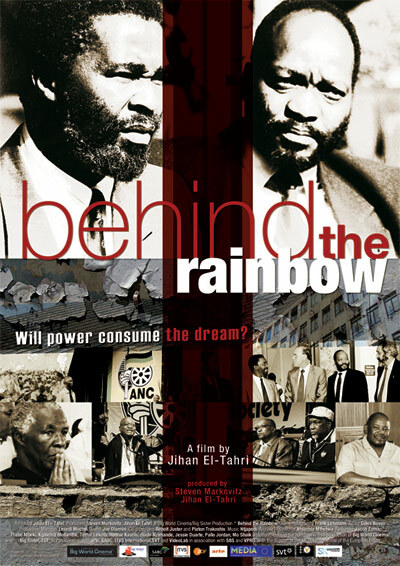 My last film, the South African film [Behind the Rainbow]...it was the most delicate moment in the history of a nation. Everything about it was difficult, that was the nature of what I was doing. I wasn’t thinking, “oh who’s going to do this, am I going to build enemies?” Obviously and probably I have enemies, but it doesn’t really matter does it? Big Sister Productions, your company…the name suggests surveillance, being on the watch. Is this a parallel to “big brother” that you are watching them and be careful because you see what they are doing? It does have an African and a Western choice for it. Most of my friends in Africa call me “grande soeur”, and the “grande soeur” in our tradition is something that is endearing. Though I am also big sister in the Western sense because I am watching you. I am not just going to fall in the trap. There is surveillance, I am looking into this closely. When I was looking for a name of the company while conversing, a friend said, “you know, big sister…and I thought, well why not name the company “big sister”. She usually calls me “grande soeur”/”big sister”. The idea is also that I am watching you, and the logo is a whirling dervish on a film reel. You have worked so far as a documentary filmmaker. Do you have an interest in fiction filmmaking? I don’t discount it. I have written two books, and I was a journalist, so writing is not scary for me. I stick to documentary for two reasons. I can write a script and direct actors and film it. I am not saying that it is easy to do that, though I don’t find it scary. On the other hand, the challenge of the documentary is far more difficult; writing an idea and going out to research it and being faced with the challenges of reality, of the real world, being constantly obliged to adjust and rethink what it is you intended to do. In fiction I write my story and film it. There is not going to be any soul searching or questioning, it is about how you do the film, how you express it. 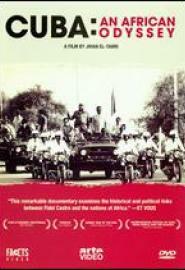 I’ll give you the example of the Cuban film [Cuba: An African Odyssey]. The project I wrote and what I thought I was going to do was about how proxy wars between the Eastern bloc and the Western bloc during the Cold War were played out on African soil and we were the victims of it. The more I researched the more I realized that, yes that is what has been written, but the reality wasn’t that. It is only when you go out in the field that you realize that just because it was not written does not mean that it did not happen. Most of the time on our continent, we don’t write our own history. Our history is written for us. This whole story that came out of the Cuban film was something that hadn’t been written and that I only discovered while I was researching. It is this challenge of readjusting what you think and what it is that you’re really doing. It’s very important, it is ten times more difficult because you have to stop and readjust and think, “am I on the right track, am I on the wrong track, do I go forward with this or am I going to come up with something that is completely insane. Have I been misled? And that’s why it takes so much time. I might want to do fiction. I don’t know, though at the moment, which brings me to my second reason why documentary is so dear to me, there are very few African documentary filmmakers, most African filmmakers go for fiction. I think it is a part of me coming from an African and Middle-Eastern perspective looking at my own history and giving it my own voice. That is what we as Africans and Middle-Easterners, and Developing Nations in general, need to be doing. And that is why what I am doing currently; executive producing and training mainly younger South African filmmakers, is quite dear to me. I want to interest more people in doing documentary because there is this glamour bit that wants to treat documentary films as less significant or less artistic or less glamorous than fiction. There is this idea that it is not a proper film. This is something that I reject totally. The younger people must realize that you can do fiction and documentary if you want. It is not an inferior form of expression. It’s just a different form of expression. Do you feel as a woman that you work within a gendered perspective? Do people treat you “as a woman filmmaker”? As a woman? Of course I am treated as a woman and you have to prove yourself three times round before you are considered anything of worth and you have to be three times better to be equal. It is something that I refuse to fall into. I do not want to be in a ghetto of any form or space. And being labeled “African filmmaker” is already a kind of a ghetto. Because, I am a filmmaker, yes, I am African, but “African filmmaker” sort of puts you in a niche. It has its own implications, fine. And “woman African filmmaker” is yet another ghetto. A ghetto that has its advantages and if one slips into these advantages you could go through life very easily just being part of this and survive quite well. I don’t want to be limited by my gender, or my space, or my identity to do and express what I want. I always get the question: why do most of your films not have women in them? Most of the films that I deal with do not justify having women in them. My political films are about the decision makers. I want to look into the decision makers’ minds. The reality is that women have not been decision makers in this area. And I always get people who say: well you could have interviewed this or that woman. I am not going to make the excuse to stick a female face in a film just to have a woman. I think that women have a fundamental role. I am a woman, I am completely a woman, and that is who I am. I find it repressive to be bottled up, to bottle your imagination, and bottle your expression. For example, most of the African women filmmaker events—which I do go to because that is who I am—people want you to do films about Africa and about women or about social conditions that involve women. It has to be in that space. I want to find my wings. I want to talk about anything that I feel like talking. If I want to do a film about middle-aged men in Poland tomorrow, I should be able to do that. And I don’t see why I shouldn’t be able to do that, because I am a female and African? Nobody tells that to other people. Why should we be kept in that space? Questions like: but what about all the work that the suffragist did for women? Yes, though the reality of what it is that women need to find their equality and find their space today is quite different. We need to carve out our own niches by proving that we are just as good. And we are, so where is the problem? You are a member the Guild of African filmmakers and of FEPACI (Federation of Pan-African Cinema), some reflections on your role in these Pan-African film institutions? For a long time I was a lone wolf. I stayed out of festivals, out of institutions. I would not even submit my films. I did my films and went on to the next thing. Then I realized that if what I want is about expression and about a voice and about hearing our voice as Africans, at the same level and in the same niches, then I need to engage with my community. I initially started with the Guild and then in 2006 the FEPACI (Pan-African Federation of Filmmakers) reconvened, I was nominated—I did not nominate myself—and I was elected. I do believe that we are in a day and age where we can change our reality. For once in our lives it’s a level playing field. It is not just about the money, the technology is there, we all have access to the Internet, the cameras cost very little. Well, perhaps it is not a completely level playing field, but we can find the structures to do our own thing, just as well as anybody else. We are not disadvantaged if we find the way of doing it properly. So I engaged in all of these institutions but unfortunately they are very political institutions, and as such, I am starting to wonder how important the actual filmmaking or the actual voice is to these institutions. I engage in these things because I think it is important to give the space and the means for creativity on our continent, to be able to be equal in access and in space and in expression as everybody else. Look at the Latin Americans, look at the Koreans, look at the Iranians. They’ve managed to establish a system that allows them a cinematic and filmic voice out there that competes with everyone. So why can’t we do it? And that is why I engage with it. We are not quite there yet because the actual foundations of most of these institutions are political. Unless we separate the political from the creative and the actual needs of filmmakers to evolve we will be without representatives. We do not have representatives, we do not have people who speak in our voices and it is quite ironic coming from me because I am suppose to be a representative of these people. I do not feel that I represent anyone and I don’t feel that what we do in these institutions even tries to represent everyone. I think our main problem is because of our history, we do not believe that the pie is big enough. Whoever gets his hands on the pie does not want to share and wants to keep that pie forever. I believe that the pie is plenty and the more people that feed off of it the better we are. We need to get that perspective in our heads yet we haven’t. Would a national cinema that we talk so much about be in conflict with your argument against political institutions? National cinema does not mean national political involvement. Perhaps I should not compare with the French, but they have the CNC [Centre national de la cinématographie], which is a non-political fund that allows you to do your creative thing. So having a national cinema doesn’t mean that the national political institutions have to dip their noses into what you are doing. Having the infrastructure for arts and culture is part of what we fought for during independence. Remember Amilcar Cabral? Remember all of these people. Culture was a fundamental part of what we were fighting for, now that is off the register. I am not against national cinema, but I am against politicized national cinema. And I am against using national cinema to further political ends. They are two separate things. Some reflections on African cinema, its history. Its future. Are you optimistic? Of course, I am optimistic. I wouldn’t be still active if I wasn’t optimistic. Though I suppose I am not totally optimistic! When Sembene did La noire de… it was criticized as not being proper cinema. Because he dared find a different language for his form of expression, the voice was coming from a non-Euro-centric perspective. Finding your own language for telling your own story is something that we have been evolving in. Even with experimental films, there is a lot happening our there, the young people are bypassing all of us. They are going straight to the Internet, straight to DVD. A lot is happening out there, so of course I am optimistic. Though the core of what is recognized as African cinema is part of the old machine that dares less. You teach as well, which is part of this whole filmmaking practice of finding one’s voice. Could you talk about some of your interests, your experiences? I teach on and off at film institutions in South Africa. I suppose what I have learned while teaching over these past few months is that teaching in this classical sense is not what I want. Because people who end up in the film school are people who can pay tuition to go there. Not necessarily the people who are dying to tell their stories and who have the creativity but don’t have the means. What I have found much more gratifying is working hands-on with young people who come to me saying, “I have this documentary idea but I am not quite sure how to go about it.” I say, “great, let’s sit together and start from how you write the proposal, to where you go,” doing coaching for research and actually being part of the entire process until the end of the edit. It is not my film, though I am there as part of a teaching pillar whenever there is a real practical problem for that one person doing that one film, and then I move on to another film. Practical work is what we least have. I remember at a film festival where the European Union came to do a panel about the Media Fund and how amazing it is and how we can access it and so on. The Media Fund has a pre-production phase and a post-production phase. Though during the entire production phase you could not do anything with students hands-on. To explain this: the Media Fund gives a lot of money for workshops, a lot of money for festivals, a lot of money for three-day courses to teach this and that. They will not give you money for that same person who you will get in a workshop for three days. Give you that same amount of money to have him as an intern on your film for a month where he will actually learn the ropes. I asked, if it is the same amount of money, and if your real intention is for these kids to learn the ropes, why not invest that money in a film that will be actually made, and the student will actually have hands-on experience? Response: that is not part of how we do it. Obviously it is not. Because the whole workshop mentality has become a new system for us. We move from workshop to workshop and what is it we actually get during the three days? We fall right into that system because it’s all there is. That is part of the reason why all of my films are entirely funded by broadcasters for mainstream TV and cinema. Why? Because that is the battleground. I do not want to be funded and make a film that only circulates in a festival circuit where the only people in the festival are in the same boat as I am, and to whom I can show my film at home in my lounge. Having a voice is about going out there and reaching the way others reach, and I think we have not cracked this nut yet.